No it's not an ancient mystical riddle or Rubik's Cube. Lead nurturing should actually start at the very beginning of your sales and marketing campaign, not after lead conversion. Instead of thinking about lead nurturing as a series of post-conversion events, why not plan for the sale and work backwards? Why not envision your customer as a done deal, then figure out how you got there and plan for the next sale? Here are a few things you can do up-front to make sure that your lead nurturing campaigns deliver the goods. Armed with this information you can develop more effective lead nurturing campaigns that match perfectly with each demand generation campaign or channel. PPC Campaign - "Attract and Convert More Qualified Sales Leads" - this leads to an A/B tested landing page for a TOFU white paper on persona development. Lead Nurturing Campaign - Email #1 (2-3 days later) - "How to Map Content to Buyer Personas" - this leads to an A/B tested landing page for a MOFU white paper on content mapping. 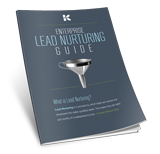 Lead Nurturing Campaign - Email #2 (5-7 days later) - "Lead Nurturing Secrets of the Fortune 500" - this leads to an A/B tested landing page for a second MOFU white paper on lead nurturing best practices. Lead Nurturing Campaign - Email #3 (10-12 days later) - "Building Positive ROI into Your Digital Marketing Plan" - this leads to an A/B tested landing page for a BOFU calculator with links to your services, pricing and testimonials pages. Lead Nurturing Campaign - Email #4 (15-20 days later) - This is the pre-close. Since your target is VPs who "get it," don't play games - get to the point. Make this a personal email from you (the sales rep) summarizing what you can do for them and a clear call to action to take the next step, ideally an appointment. What if the Campaign Fails? This is vital information, as well. Go back and see where the interest level appeared to drop off. Too many emails? Wrong subject matter? Content too salesy? Moved down the funnel too soon? You may need to revise your reverse-engineered customer conversion model, but don't be too quick on the trigger. Give statistics a chance to find the real trends. The bottom line is that you shouldn't look at marketing as anything but a continuum with a coherent, dynamic strategy. Persona development, content mapping, lead generation and lead nurturing should all be planned at once from the perspective of a buyer, not as a fishing expedition trying a bunch of different baits. By doing so, you have the best chance to attract real buyers into the top of the funnel and move them down towards a sale more efficiently. This in turn can shorten the sales cycle and improve revenue generation. Are you a medium- or large-sized business marketer? Discover the 4 critical steps to lead nurturing campaigns with this helpful guide.